From the time I was a little all the way through highschool- the dress-up chest in our basement provided so much fun! I have so many good memories associated with it that I am taking up a crusade for every house with children to start one. 1. Promotes imaginative play. This is probably the biggest reason. Having interesting props and costumes around sparks so many unique kinds of play. 2. Creates great photo-ops. What's cuter than a little girl dressed up in her momma's wedding dress or in a ridiculous wig? 3. Inexpensive fun. All of the contents of the chest can be purchased at garage sales, thrift shops, or just inherited from friends and family. No need to spend a lot of money! 4. Handy to have costumes on hand for costume parties, harvest parties, and Halloween (if your family participates). 5. Preserves memories. An old evening gown, wedding dress, or army uniform may have lots of sentimentality attached to it, but without a possibility for future use it can sometimes be difficult to justify keeping it around. 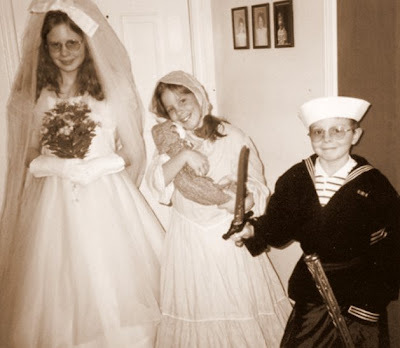 Having your kids dressed up in old things is a great opportunity to share stories from the past. 6. Thrill of the chase. Once your family has figured out what kinds of dress-up clothes it likes to collect, tracking them down at garage sales, etc can be a lot of fun! 7. Excites interest in history as children learn about period dress. My town growing up hosted a Civil War Muster every year. 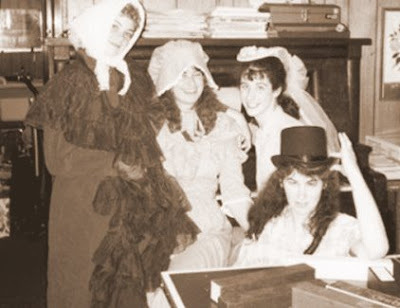 Some years we would take the contents of our dress-up chest and put together realistic outfits for attending. 8. Appeals to a wide age-range. Most toys are pretty age-specific, and kids grow out of them in a year or two (or less). A dress-up chest is an efficient use of toy space because it can be enjoyed by toddlers through age 12 (or even older). 9. Facilitates creative school presentations. We used the contents of our dress-up chest for book reports, speeches, and skits (not to mention all of the school plays that made use of our costumes). 10. Flexible enough to accommodate your family's changing interests. If your son develops a sudden interest in the Wild West, you are sure to be able to find cowboy boots, hats, and toy horses at garage sales. If, the next week, he is interested in the army, you can help fuel his imagination with fatigues, toy guns, and army tents. 11. Feeds a little girl's sense of femininity to be able to dress up in pretty dresses. I realize that this isn't necessarily a good thing in everybody's book, but it is in mine! 12. Encourages the making of homemade movies and plays. 13. Provides a sense of connection and participation in the stories of old books. The classics are so much more fun when you can become Jo March or Huckleberry Finn. Do you have a dress-up chest? Have you found perks besides the one's I've listed here? I'd love to hear about them! All great reasons to have a dress-up chest! I'll have to be sure to start collecting dress-up clothes for my baby girl. All excellent reasons. We ended up with a dress up chest by accident when I assembled one for the drama classes I did at the pre-school. My dd rescued a costume out of it just a few days ago, and she's now a teenager. I love having a dress-up chest, even as an adult. Costumes are fun. Happy TT!